Joint Specialist's Anode Sealing Cap (ASC) seals the critical connection between the anode lead wire and the anode. The Anode Sealing Cap provides stress relief at the wire connection. It seals and electrically insulates the end of the anode where the lead wire exits the anode. 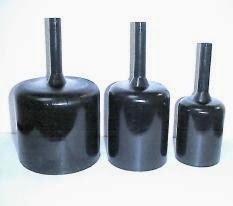 The Anode Sealing Cap is the ideal solution to prevent premature failure of the anode typically caused by corrosion of the wire connection. Each cap is expanded to allow clearance for easy installation over the lead wire and the anode. A rubber based sealant is coated on the inside of the cap. remains durable and water tight. Ring & Ball Softening Point: 90 c.